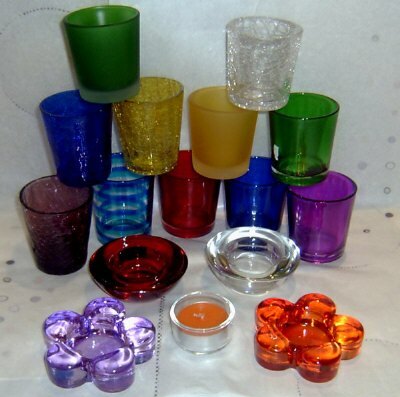 Assorted coloured glass votive and tea light holders. If you are not fussy, and just want some lovely assorted coloured glass votive/tea light holders to scatter around your home these are ideal, more than half price these make an excellent bargain for brightening up your home. Colours shapes and styles will be assorted. Price is per unit. Holders may be in any colour patterned or plain subject to stock from our entire votive holder range. Picture guide only and is not necessarily representative of what will be sent. Holders may be shop soiled.